No matter what type of procedure you are getting done, you have to remember that there will be a price tag attached to it and most medical procedures tend to be expensive. Most of the times, people have this notion that hair transplant procedure will burn a hole in their pocket, but it is important to remember that good quality, experience and a high level of professionalism will demand money. However, at AK Clinics, the final cost of hair transplantation will depend solely on what kind of procedure & surgeon you are going for. If you are going for a non-surgical procedure, it will not cost you a lot, but if you are going for a proper transplant, you will need to shell out a little money. Hair Weaving cost may be less in short term but in long term most people go for transplant or stop using hair patch. You need to remember that when you come to AK Clinics for a hair transplant, we will offer you a procedure that is minimally invasive and our team will ensure that you have the most natural looking results, with the least amount of discomfort. We will be using instruments and equipment that is state of the art and our team knows how to utilise it in the best possible manner. When you add all these together you will realise that what you pay will actually be a great investment for yourself! The general principle of the procedure is based on the fact that the hair that originates in the permanent area or Safe donor area’ are not affected by the DHT. Since, the genetic vulnerability to the DHT residues in the hair follicle, the implanted hair will be resistant to the effect of DHT and will continue to grow. 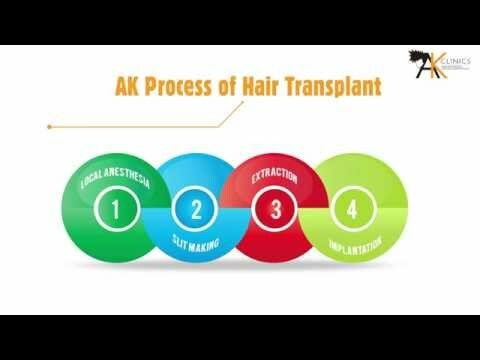 At AK Clinics, we have improvised each and every steps of the hair transplant to give results in most patients. Though this is a medical procedure and has its limitations but still it is really rewarding at AK Clinics. Following is how we have developed our own technique Bio-FUE™ and improvised the conventional technique. Almost 4000 follicles to 4500 follicles will be required to treat the area. It is important that Medical therapy is given along to preserve the existing hair. Definitely a case of Gigasession or requires 2 sitting to cover the complete area. Getting a proper head of hair is often all that a lot of people need to get their confidence in themselves back and at AK Clinics, we will do just that for you! Following are the approximate cost range for different standard clinics for hair transplant. The cost of hair transplant procedure is determined on a “per graft” or “per follicle” basis and the number is dependent on individual’s bald area, clinic, surgeon’s experience and expectation from the hair transplant. That is the reason it is no realistic to provide an exact estimate. Instead, we encourage patients to share their hair loss pictures and schedule a free online consultation with our doctors. Disclaimer: The above mentioned price is only for reference, every patient is given a custom quote depending on the choice of surgeon, location and technique. There is Service Tax/GST applicable on the cosmetic surgeries in India. I started facing hair loss at the age of 26 but it was not very noticeable. But at 29 the hair loss progressed very quickly and crown almost became empty. And further my hair line receded quickly. Now at the age of 31 I started looking very old. I tried many medicines like homeopathic etc etc but nothing seems to work. Then I started searching for my options and finally decided for a hair transplant.
" Had a hair transplant at AK clinic under care of Doc. KAPIL DUA.And after treatment it has been 3 month now and I have very much inproved growing hair. He is best surgeon ever seen and very experienced in this art. They also provided very good atmosphere while surgery. With his experience he gave very confident to his patients while surgery.
" After talking to Dr Kapil I have decided to go for a hair transplant surgery which turned out to be very good. Total of 6000 grafts were transplanted. The density was medium density. The procedure was FUE without any scar. The procedure was by done both Dr Kapil and Dr Aman. I strongly recommend anyone who is looking for a FUE surgery in India."